NASA astronaut Jeffrey Williams swung open the door to the newly expanded chamber and was the first to enter. He said it was pristine but cold inside. 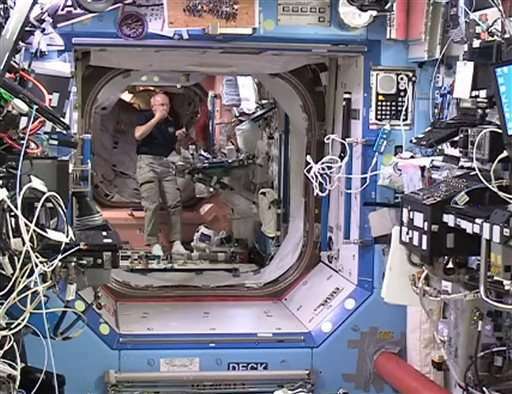 The room—called the Bigelow Activity Activity Module, or BEAM—arrived at the International Space Station in April, packed in the trunk of a capsule loaded with supplies. It was inflated just over a week ago. Mission Control said the temperature registered 44 degrees, as anticipated, at one end of the 13-foot-long, 10 ½ -foot-wide chamber. There was no trace of condensation, Williams noted. For now, BEAM is empty and dark; Williams and Russian cosmonaut Oleg Skripochka wore head lamps to illuminate the crinkled, silver walls. They collected air samples, took expansion measurements and made sure the air-pressurization tanks were empty, before exiting and closing the door behind them. 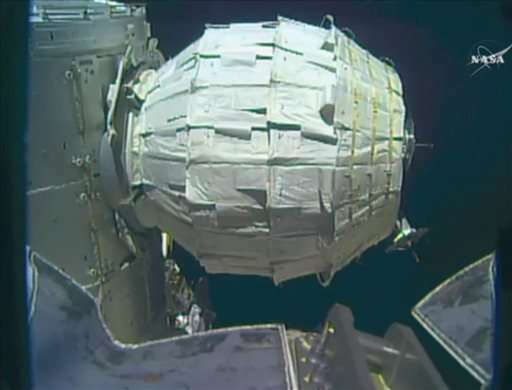 The six-man station crew will deploy more sensors and other gear over the next few days. After each brief entry, the hatch will be sealed. Mission Control anticipates just six or seven entries a year. NASA wants to make certain the multi-layered BEAM—an experiment led by Bigelow Aerospace—can withstand wide temperature fluctuations, radiation and debris impacts over time. It will remain at the orbiting lab for two years. The Nevada-based Bigelow is developing even bigger and better inflatable habitats for space travel. Until BEAM, the company founded by hotel entrepreneur Robert Bigelow had flown only a pair of inflatable satellites in orbit for testing. Both Bigelow and NASA envision using pumped-up habitats for Mars expeditions. Inflatable spacecraft are lighter and more compact for launch than the traditional metal housing for astronauts, yet provide roomier living quarters once expanded. I know you are being sarcastic. Still, I will remind you that the Kelvin scale is not expressed in degree. Now you can add this to your knowledge base. @TechnoCreed Excuse me, you must be American using the Farenheit scale. The Kelvin scale to which you are refering uses the Celcius "degress" which are real, usable and apply to the Kelvin scale. Time for you guys to catch up with the rest of the world and switch to the metric system. Wrong. And how idiotic do you have to be to correct someone when you're wrong- whilst misspelling it. Maybe the US is the place for you. Excuse me, you must be American using the Farenheit scale. On this, the only part that you have right is that I live in America... the continent at least. But your intuition fell very flat for the rest of it; I am French-Canadian I live in the province of Québec. Canada converted to SI in 1970 and almost everything is metric here; one major exception is lumber and construction material. Even though I was only 9 when the conversion was made, I am still way more comfortable in the imperial system. I am 5 feet 9, 170 pound; do not ask me to answer in metric it does not come naturally. Also, even if the education system employs SI, it is much the same for my 20 years old son who grew up strictly in the SI system. One thing you have got to understand about this is that the imperial system is ingrain in our culture... it is something that is part of our history and that we hold dear even though we have to let go of it. So please do not be so condescending. The Kelvin scale to which you are refering uses the Celcius "degress" which are real, usable and apply to the Kelvin scale. What you did not get about my first comment, the one in reply to dirk_bruere, is that you cannot refer to the Kelvin scale as Kelvin degrees; that would be wrong. IOW you cannot say 0 degree Kelvin or 44 degrees Kelvin or 77 degrees Kelvin. You must say 0 Kelvin, 44 Kelvin, etc. N.B. : SI refers to the International system of Units. Is it safe to assume that's a chill 44 degrees Fahrenheit and not a blistering 44 degrees Celsius? I think d_b's point was that a unit of measurement would have been nice for clarity. One issue not addressed so far in this thread is that it should be pluralized and not capitalized, as in 0 kelvins or 44 kelvins. I explained why the kelvin was ruled out and since the text mentioned 'cold', it rules out Celsius too. So any comment on the thermal unit involved is either a lack of culture, or condescension. Thank you for your comment, there was something in it for me. addendum: If you talk about the 'Kelvin scale' it have to be capital K.
I find your comment offensive and unwarranted. Just a reminder; this kind of mistreatment of genders is prejudicial to women and should be avoided. and have been reported to the police for stalking. Seriously, I can see you know that. You were here when it was real. You must miss those days. What's wrong with politely calling somebody out on their misjudged comment? as TC pointed out ScottyB is normally polite, and given some of the abusive comments on this site maybe he didn't realise his comment would cause offence. Posting elitist WASP poetry on a science site is particularly offensive and inappropriate. You have been reported to mods and also to the DNC. And using animals to hunt other animals for pleasure is also offensive. You've been reported to various animal rights advocates and so has Yeats. *sigh* i do, i really do. I find you offensive and unwarranted. Funny, the only people i see protesting my choice of words are two guys. Maybe i should have said "Stop arguing children", of is that offensive to children? Oh god i just don't know anymore.